This week’s Five Minute Friday prompt went along with my planned post about Rachel, so I’m combining them. First up, FORGET for Five Minute Friday. One prompt. Then just write for five minutes. Kate Motaung hosts this writing flash bob. Come join us there. Really, not remembering is one of my fears as a mother. That’s why I document – in scrapbooks, on social media, in notes on my phone, and in school and birthday books. I want to remember all the moments – the good, the bad, the hard, the surprises, the laughter, the trips, the slow mornings, the meals at the table. Most of all, I want to remember what God has done. 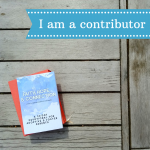 My greatest personal testimony of God’s faithfulness in my family of five. There’s the redemption that’s come in our marriage – a relationship I’ve taken for granted more times than I care to admit. There’s the story of how God made us a family in a way I never expected. 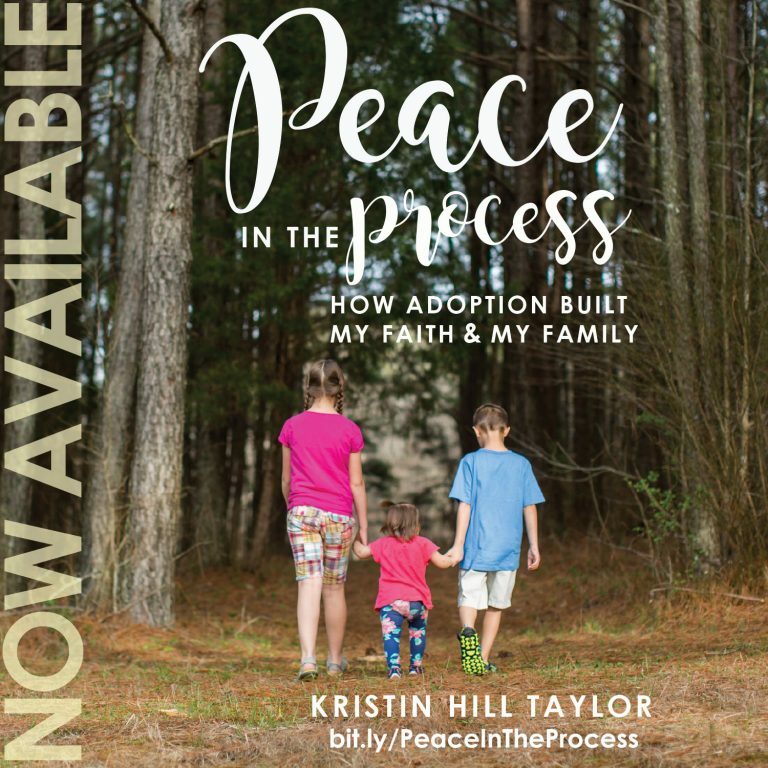 Adoption built my faith and made us a family. Those are the highlights, but God’s faithfulness is woven through our everyday moments. I want to keep seeing it. I want to remember what he’s done and what he promises to still do. People look at her pictures or walk by us in the grocery and say, “She’s just the happiest baby.” And she is, really. I know I say this every month, but, goodness, we’re blessed to have this girl as our third child. It’s amazing to see God’s plan come together for her and for us. And the fact she’s so happy and easy going makes it all even more delightful. Of course, she’s still trying to cut some teeth, which she isn’t always happy about, but her fussing about it is short lived and can be usually be cured with some Oragel or Baby Mum Mums. I can tell her gums are irritated in two places. I blame the teething for her more unpredictable sleeping habits that lately have involved waking up – at a varying early-morning hour – to eat. Let’s be honest, y’all know I’m not a fan of the sleep regression. But she’s even happy once I rescue from her crib at 4:40 a.m. – a time I firmly believe was meant for sleep. Here’s to hoping we can start the smiling fests at 6:30 a.m. or later. Any other time of the day, Daddy and Ben get the quickest smiles, but she’s generous with them. She especially loves when people talk to her. She also loves Johnny Jump Up, chewing on stuffed animals and blanket tags, and naps in her swing. She still enjoys eating every 3-4 hours, hence the rolls on her thighs that are going to be adorable in the swimsuit I recently bought her and why I’m trying to incorporate cereal and applesauce. And speaking of rolls, she has been easily rolling from her belly to her back for a while, but she conquered going from her back to her belly yesterday – on her last day as a 4-month-old. She manages to scoot short distances on her back. She wears size 3 diapers and is mostly in 3-6 month clothes, although she’s outgrown some that have been mailed to get cousin Roslyn, who is 2 months old. 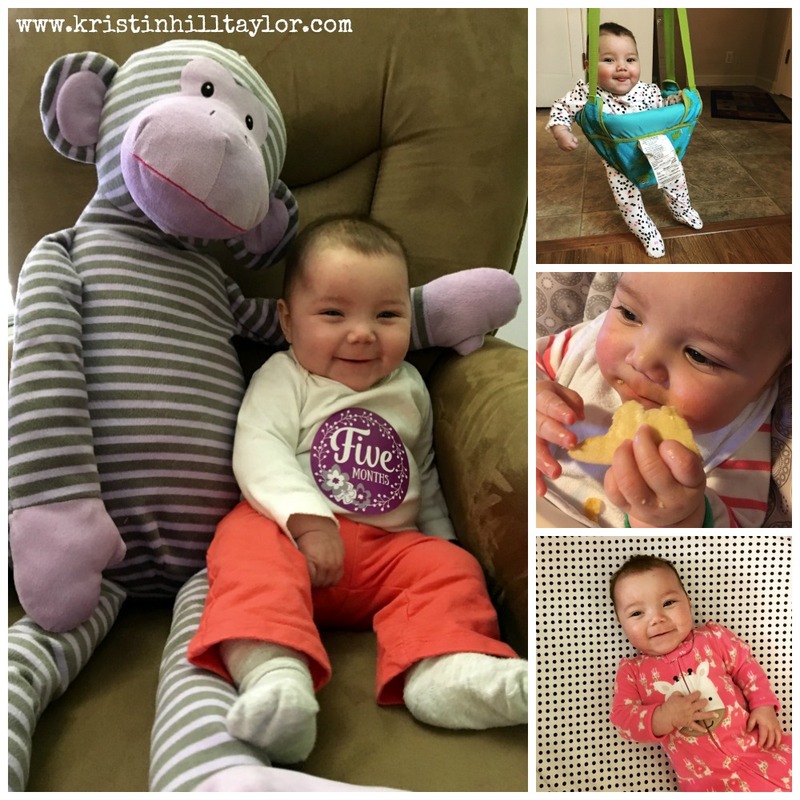 We’ve loved these first five months of Rachel’s sweet life and are looking forward to what’s to come! Look back on Rachel’s growth :: One month. Two months. Three months. Four months. 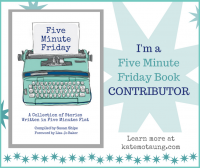 I’m linking up with Kate Motaung for Five Minute Friday, a place to write whatever it is that comes to mind, like a flash mob. But, let’s be honest, I MUCH prefer words to dance moves.